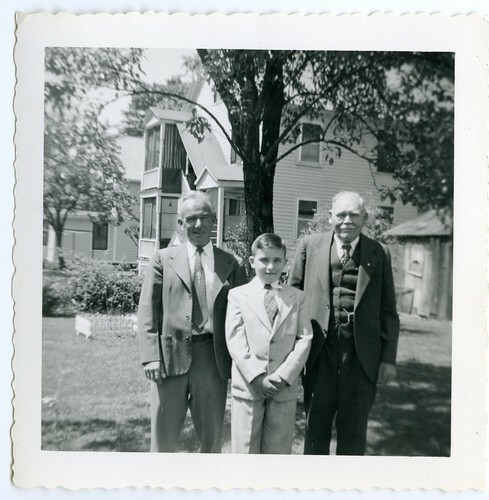 My father with his father and grandfather. Wondering about using screencasting tutorials for basic things (email, double clicking) when customers have low level or no technology skills. How helpful will that be? And become frustrated that we need to develop tutorials to show customers how to use our systems. How is screencasting different from webcasting? or podcasting? or videocasting? Oh MY! idea: dead end page-- a tutorial on how to use the catalog. do you need help searching? seeing some examples-- having difficulties formating for various sized screens. needs to be able to fit various sized screens. ireadblogs: articulate will format powerpoint into slides online. can add audio. olin library @ cornell: research minutes (90 seconds) holds the attn span. concise and well edited. hosted on youtube. gets the main point across. goofy. fun. (a good example) what are the essential factors about the lesson. one point per screencast. screencast storytime: can be run at home. storyhour? write down all that you want to share. cross out most of them. plan out the steps. focus on one skill set. wink is free and can be wonky. sign up for an email account. printing. downloading audio. accessing databases remotely. custom search in refusa. craigslist or ebay brief overview tutorial for upcoming classes.